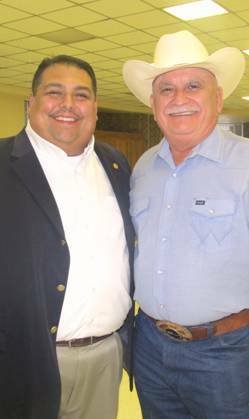 State Representative Ryan Guillen (D-Starr) (left) stands with Starr County Farm Bureau member Refugio Alaniz (right) during the organization's annual convention Thursday evening in Rio Grande City. Rep. Guillen gave an in-depth review of the accomplishments and setbacks of the Texas 82nd Legislature while providing farmers and ranchers in attendance with updates on the state's agriculture industry and border security efforts. An experienced rancher, Guillen listened to the concerns of Starr County's agricultural community and stated he plans to address the issues during the state's 83rd legislative session. As a chapter of the Texas Farm Bureau, the Starr County Farm Bureau is an active voice for ranchers, farmers, and all involved in agricultural practices.